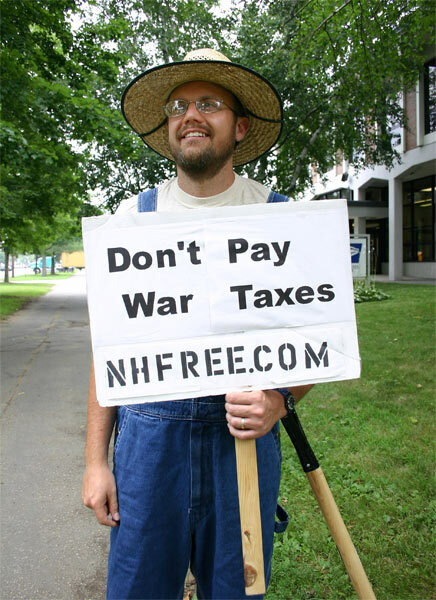 Russell Kanning, editor of the Keene Free Press , and a war tax resister well-known in “Free State Project” circles (a project that is encouraging libertarian-minded people to move to New Hampshire in the hopes of forming a political critical mass), was arrested — twice —  yesterday for visiting the IRS office in Keene, New Hampshire with the intent of handing leaflets to its employees. The leaflets quote the Tokyo War Crimes Tribunal: “Anyone with knowledge of illegal activity and an opportunity to do something about it is a potential criminal under international law unless the person takes affirmative measures to prevent the commission of the Crimes.” The reverse side is a sample letter that IRS employees could send President Bush to announce that they are resigning their jobs. “The U.S. government is killing people around the world to expand its power base,” Kanning said, “It is using our neighbors as cannon fodder and your money to accomplish the evil deed. They are building an empire on our backs and in our names. They are imprisoning or killing those that oppose them. Enough is enough. He was arrested by agents from the Department of Homeland Security and charged with distributing materials in a federal building and failure to obey a lawful order. After he was booked and released, he immediately returned to the IRS office to try again (without the leaflets, which had been confiscated). He was arrested again, this time charged with disorderly conduct. Thanks to Strike The Root for plugging The Picket Line today. Russell Kanning, fresh from getting arrested for trying to convince I.R.S. employees to quit, is planning to try it again. Also: the Dervaes family turns a home on fifth of an acre in Pasadena into an experiment in sustainable living that it calls “a homegrown revolution.” And: a profile of The Emma Goldman Finishing School — a decade-old anarchist commune in Seattle. War tax resister Russell Kanning was arrested at his home Monday morning for refusing to appear in court last Friday on charges of trying to distribute leaflets to employees of the I.R.S. office in Keene, New Hampshire that encourage those employees to quit their jobs. It’s pretty much proceeding as Thoreau scripted it some hundred and fifty years ago. A number of governments have gone heavily into debt and defaulted, the central government (such as it is) is unwilling to act as a financial backstop, many citizens would rather repudiate the debt than raise taxes to pay off the bonds bought by foreign speculators… welcome to the United States in 1843. Robin Hood and his Merry Men from Keene, New Hampshire, win a First Amendment case for their war on parking tickets. Also: you know who else is legally exempt from paying Social Security tax in the U.S.? Employees of subversive communist organizations. The Picket Line interviews Russell Kanning about how he resists taxes and the state, and why he wears overalls and a straw hat and holds a pitchfork while he’s doing it.